Heinz Anger, painter of landscapes, portraits, still lifes and figurative compositions, had been seeking his very own style with unusual consistency since the completion of his education. 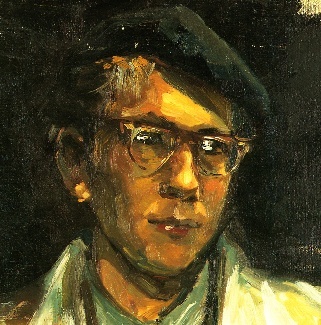 An early self portrait of 1957 shows critical eyes, maybe self-critical; someone who is technically accomplished but on the search. The sophisticated craftsmanship of his teacher Sergius Pauser can be seen in the large scale portrait of his daughter Beate; though flawless in quality, it was still not what Anger ultimately was seeking to achieve, he was in search of the truth within. Anger uses in his works a range of symbols; to name just a couple of examples from nature: we find mighty ancient trees, deeply rooted and in tune with their environment, standing for long life and wise old age, – on the other side we see emerging tender new growth, symbolizing light-headed yet still insecure youth. Anger never intended to conform with what is called 'modern'; but he tries to rejuvenate through his creations by referring back to primordial nature. Anger’s art is unmistakable; one recognises his use of light, his application of colours such as striking -even startling- yellow, rich blue and violet, and the boldness in his choice of motifs - for example a combination of an atmospheric pond and the bright sun. Anger is an eminent painter of landscapes. In strictly Austrian tradition, he often puts a humble motif into the centre of one of his watercolours (see gallery watercolours): Inside a forest, a path covered with snow, wine cellars along an alley, hilly landscapes. He finds his inspiration in his favourite spots in and around Vienna, in the Vienna Woods and in nature parks. One notable addition to Vienna is Venice, which Anger visited repeatedly in the 1990s. Narrow canals, hidden corners, stone bridges and decaying palaces provided motifs for a series of oils and watercolours. Strong symbolism, like in the above watercolour, is found in some of his figurative paintings, such as his important “Mutter und Kind” (Mother and Child) triptych, one of his signature oil paintings, portraying members of his family. Anger’s landscapes are deserted of humans; evidence of humans is often present, such as the gate, tracks in the field, structures and buildings, but not the people themselves. The landscapes in Anger’s watercolours are depicting nature as such. In his oil paintings, on the contrary, the light, often the bright sun, is enhanced and assumes symbolic character. In his oils paintings Angers repeatedly used motifs such as sunflowers, lilac and peonies at different stages. “Pfingstrosen” (Peonies) from 1993 on the first glance seems just a bunch of lush peonies in an ornate crystal vase. Upon closer examination the eye is drawn to a dark red object on the left side, mostly in the shadow and hidden by the flowers, so its exact nature cannot be determined; it becomes the mysteriously glowing centre of the picture (in gallery oils). 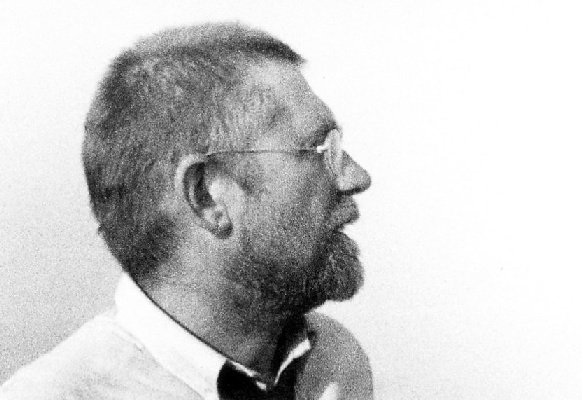 In his search for truth in nature the artist is approaching almost Waldmüller's ideals of imagery. However, in his impressionist symbolism he is close to van Gogh, Klimt and also Franz Wiegele, whom Anger considers one of the most important pioneers of Austrian painting. 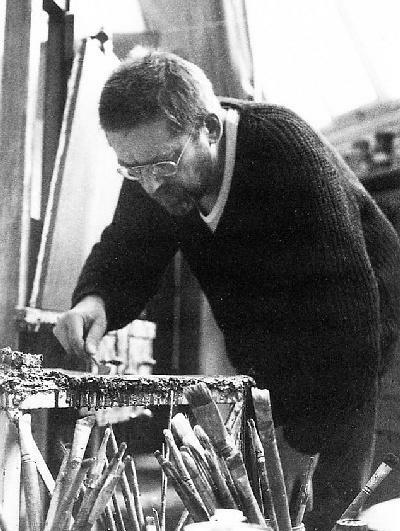 Heinz Anger was born in 1941 in a village in Niederösterreich (Lower Austria). His parents lived under rather simple circumstances in Vienna. Until the end of WW2 Heinz spent much time with his grandparents in a rural village in an area which after 1945 became part of Czechia. He witnessed them being pushed off their land and finally settling in the village of Ernstbrunn, north of Vienna. From 1947 to 1955 Heinz attended primary and secondary school in Vienna. First signs of his talent showed in 1953 when he copied numerous post cards using crayons. At the age of 14 he joined „Graphische Lehr- und Versuchsanstalt“, the Vienna college for graphics. Over the next four years he acquired drawing skills and techniques under Professor Karl Zecho (1896-1965) and Rudolf Reinkenhof (1905-1980). Reinkenhof had a formative impact on him, not only for the skills Heinz acquired, but also for his artistic views. By the age of 16 Heinz had chosen to live on his own in a small rented studio. From 1959 he attended the „Akademie der Bildenden Künste“ (Academy of Fine Arts) in Vienna. He studied with Professor Sergius Pauser (1896-1970) and his assistant Hans-Jörg Vogel, where he learned, among others, Mischtechnik (as used by Hans Holbein). In 1960 he changed classes and joined Paris Gütersloh (1887-1973). In summary, Heinz Anger learned classical craftsmanship in Vienna. His skills assisted him in launching a career as a graphic artist, and formed an essential basis in the development of his own style of painting that was to follow. In 1961 he met Helga Bauer who became his muse and, one year later, his wife. He left academy and took up employment as a commercial artist. In 1962 Anger was commissioned to paint a portrait of Viennese soprano Leonie Rysanek, who at that time was already one of the world’s leading opera singers; it meant an extraordinary experience for the young artist. As a freelance illustrator he worked for all leading marketing agencies in Vienna. In this period he also created a range of paintings in the sprit of the “Phantastischer Realismus" (‘Vienna School of Fantastic Realism’). In 1964 he lived with his wife in Ernstbrunn in Lower Austria; during this countryside residence he created a cycle of etchings called “Umarmungen" (‘Embraces’). In 1965, back to Vienna town, his daughter Beate was born. He accepted employment by the international advertising agencies James Walter Thompson und McCann Erickson. One year later he resumed freelance work, which gave him more flexibility to pursue his new ambition in film-making: He wrote movie scripts, and in 1969, on his own account, shot a professional quality 30-minutes feature film ,,Die Wand"(“The Wall”) with locally well known actors. However, officials of the Austrian Youth Film Festival judged the film as being traditional cinema and "too professionally produced". Anger turned his back on the media. From 1970 Heinz Anger refocussed on painting. He created a range of panels and drawings in a new style, a kind of Austrian Pop Art, oriented on the works of Richard Lindner and Hans Bellmer. 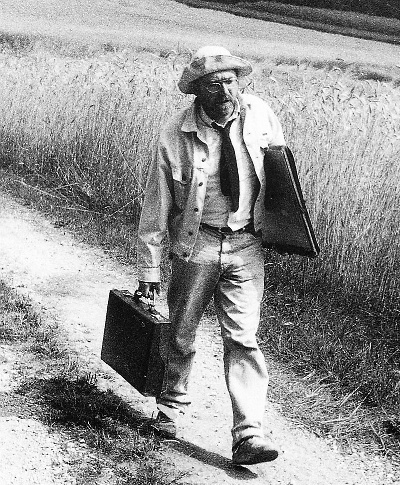 His paintings were shown in an exhibition in Galleria Viotti in Turin, Italy, in 1976. The stunning and consummately executed paintings received high critical acclaim, but failed to achieve commercial success with private buyers in Turin. This might have been due to the explicitly sexual topics they addressed, and being ahead of their time. Anger conceived his striking poster-like panels as cynical criticism of the banal consumer society with which he was utmost familiar: In his professional job as a graphic artist he was creating brand images and marketing campaigns for international organizations from petrol companies to leisure centres. Around this time he also developed a passion for opera, and became a regular visitor at the Vienna State Opera. 1979 his son Lukas was born. By around 1979 Anger had developed the painting style he today considers to be “really his” artistic expression - which is the subject of this website. The following years were marked by the transition from graphic artist to full time painter. 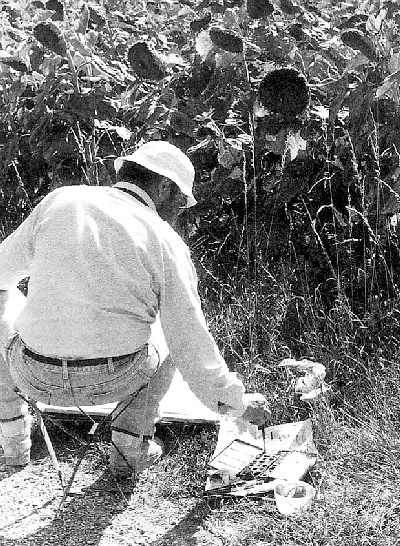 In 1986 Prof. Dr. Hans Bankl offered him an opportunity to create drawings within the Department of Pathology at his hospital. The results are one oil painting and 60 drawings. In 1987 Anger had his first solo exhibition at Galerie Zentrum in Vienna. It was followed by further two, in 1989 and 1992. In the same year they published the art book "Der Maler Heinz Anger". From 1994 onwards Anger regularily visited Venice, Italy. Its canals and crumbling ancient architecure provided inspiring motives and led to the creation of an extensive range of watercolours and oil paitings. In 2000 a significant solo exhibition was staged at Tulbingerkogel (Galerie GTK) near Vienna, followed by a second in 2002. In subsequent years Anger has been showcasing his paintings at numerous galleries and venues in and around Vienna.